Subway Squawkers - A Yankees-Mets Rivalry Blog: Michael Kay and Jodi Applegate Get Married -- But What About the Chicken Parm? The New York Post had a big story today about Michael Kay and Jodi Applegate's wedding at The Plaza last night. And it just goes to show you the things people will do for love. There was a "giant seafood bar with six-foot mermaid ice sculptures," and "guests feasted on filet mignon and branzino" according to the Post. Seafood at Michael Kay's wedding? I'm shocked! As I enjoyed a bowl of clam chowder, Michael mentioned that he had never had soup in his entire life (he thinks the slurping sound associated with it is grotesque). I found this amazing. He then told me he had never had any fish or seafood of any type, either. As the conversation went on, he informed me of several other things he has NEVER tasted in his life: bananas, condiments of any type (though he lost a bet on his radio show and had to eat a packet of ketchup, which made him sick), jelly, any cheese not on a pizza, veal, coffee, etc. So how the heck did Kay not say "see ya" to the interlocking crab legs in a seafood bar? Or not gripe about the branzino? What's the story here? Ginger Adams Otis, who co-wrote the wedding article, wrote a piece last fall talking about Kay's wacky food habits, yet she didn't delve into them in the nuptials piece. Applegate told the Post last year that her fiance only really liked three foods: chicken parm, bacon, and steak. He's so devoted to chicken parm that he insisted on eating it when the two traveled to Italy for a 10-day trip last year. "It was like being on a great chicken-parm search through Tuscany and Rome," Applegate said. "We couldn't find it on any menus. Apparently, it's an American thing. He actually lost weight. Who goes on vacation to Italy and comes home with their pants loose?" That article said that the news anchor had "given up trying to change her meat-loving man -- and has even agreed to serve sliders and mozzarella sticks at the cocktail reception for their winter wedding." So, did he get his slider bar? Or a special groom's table with his three favorite foods, the way Southerners have a groom's cake at weddings? This is what I want to know about! The Post did have details about who attended the wedding; there were a reported 350 guests, including both Mr. G and Joe G(irardi), Darryl Strawberry and Danny Aiello (Kay's uncle), and a whole bunch of other Yankee broadcasters. 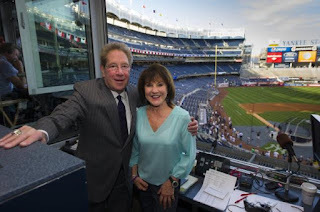 (But what about John Sterling and Suzyn Waldman?) And Rudy Giuliani performed the ceremony. Sports Illustrated's Jon Heyman tweeted from the reception that Lonn Trost danced to "Play That Funky Music." Heaven help us! I've met Michael Kay twice, and he is a very nice guy and one of the friendliest celebs I've ever met. I wish him and Jodi all the best, even if his food habits are a little, well, wacky! There was a table with sliders, hot dogs, bacon, chicken parm, etc. Was really cool! I wonder if they were hanging sliders. Kay: "Final thing: Person you would most like to have in a foxhole with you." Waldman: "Oh my goodness, goodness gracious, it's got to be Roger Clemens." I'm shocked SHOCKED Lisa, that you were not invited to the wedding. "Highlanders"? It's 2011, not 1911. Besides, the 1904 Highlanders would have beaten the stuffing out of the 1986 Mets. No way could Gary Carter have hit Jack Chesbro's spitball. So What to Do About Joba Chamberlain?